Eurol Official sponsor of Toyota Gazoo Racing Team | Eurol B.V.
Eurol is the official sponsor of Toyota GAZOO Racing. 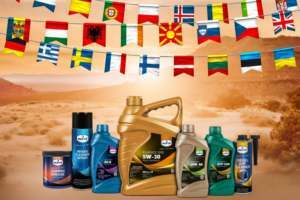 All the drivers of this factory team, consisting of Nasser Al-Attiyah, Giniel de Villiers, and Bernhard ten Brinke, will drive with the Dutch lubricant brand during the upcoming 2019 edition of the Dakar Rally. The Toyota GAZOO Racing team and Eurol work together thanks to Bernhard ten Brinke, who successfully joined the team in 2018. Ten Brinke was the first Dutchman ever to win a car stage at the Dakar Rally. Eurol has been Ten Brinke’s main sponsor for many years, and that support has now been extended to the entire Toyota GAZOO Racing team. The Dakar Rally is the world’s largest and toughest rally event and the ultimate challenge for man and machine. The Rally is broadcast in 190 countries and is second only to Formula 1 in terms of its global popularity as a motorsport event. The Dakar Rally will be held from 6 January to 17 January 2019 in Peru.